Even if you blink, you won’t miss them. Bob Wade’s artwork sits saddled atop so much of Texas that you would have a difficult time not seeing it. From Austin to Houston to San Antonio to Abilene his over-sized, sometimes monstrous, oftentimes Titanic creations have become so iconic, so much a part of our landscape that they frequently define the area that they inhabit. From the Bigger-Tex boots outside a mall in San Antonio to the New Orleans Saints helmet above the Shoal Creek saloon in Austin to Dinosaur Bob craning a wanton glance (is he about to lick it or eat it?) at a VW bug on top of the Grace museum in Abilene, Wade’s work not only dominates the environment that it occupies but also throws a giant hand in the face of our usual realities, forcing us to recalibrate our perception of space and place. Until recently, I had not realized how involved I was in Wade’s artwork. In fact, most of us have had some contact with it. His primary work involves painting over, in vibrant pastels, those photographs of Texas’ past-those antiquated, sepia-tinted pictures of cowboys and cowgirls, standing on horse’s backs, toting guns, waving to the future from a now century-old rodeo ring. But, Wade’s vision has grown to gigantic proportions over the years and now many of his works are, like Texas’ mystique, larger than life. 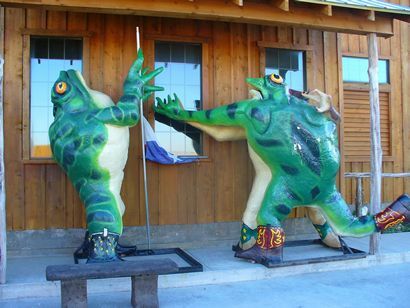 Having grown up in Dallas in the early 1980’s, I was always fascinated by the giant frogs that used to dance and twirl on top of the old Tango’s nightclub on lower Greenville avenue. When they were taken down, in late 1983, my countenance fell with them-they had symbolized a freedom of thought and imagination that I, at least, felt had always been lacking in the collective Dallas consciousness. 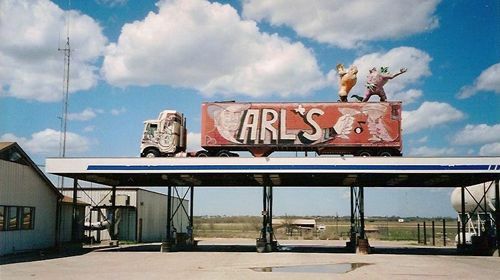 When I discovered that they had been relocated to Carl’s Corner, that town/truck-stop/concert hall/beer haven on I-35 north of Hillsboro, I was relieved. Someone, I thought, was thinking right. In any event, for whatever reasons (maybe the work reminded me of a past life, a former existence when things were simpler and made more sense) I was always intrigued with the work and the fact that it (they) had a new home was reassuring. Because I drive that God awful stretch of road regularly, both then and now, I have always kept an eye on the frog’s condition and placement. So, the other day, as my wife and I drove back from visiting our son at Austin College in Sherman, we decided to stop and have a look at the sculptures; at these ornaments of memory. Carl’s Corner is being reconstructed. Blown out, blown apart, blown away and blown down, Carl’s Corner is making a comeback. And, if you haven’t seen it recently, you’re in for a treat. It looks as though it might actually, again, become the oasis that was its original intent. There are more gas pumps out front than any of us could ever need and the ‘Bio-Diesel’ tanks behind the storefront are gleaming clean and large. When I walked in the other day I could hear the hum and clatter of hammering and drilling, although, there was not a workman in sight. The interior appears finished. Wood floors shine under new tables, railings and a slick bar. The bandstand already has the ubiquitous Texas flag unfurled on the wall behind it. In fact, as I walked in that morning, I heard the chatter of talk radio broadcast throughout the place. I assumed that the workmen had their favorite radio station tuned in-a whistle while you work sort of event. Only after walking in several yards did I notice that the broadcast was coming from inside. 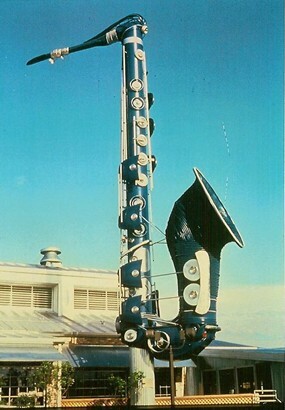 Directly within the store is the home of XM13, a new satellite radio station that proclaims itself as ‘Willie’s Place’. The broadcast booth is positioned to overlook the whole of the restaurant and bar and, of course, offers the chance for customers to watch the program. I motioned through the thick glass at the DJ to see if taking his picture was permitted. He continued to talk into the giant, padded microphone and gave me a thumbs up. I took the picture but even now I’m really unsure why. It just seemed the thing to do-I was the interloper looking for an excuse to be browsing where I probably should not have been. As I left, I ran into a worker who told me that he thought the place should be open for business this coming January 2009. Outside of Carl’s, under a slim overbite of roof, to the side of the building and obscured from easy view, three of the Tango frogs hold their frozen dance and swing. I was happier than I should have been to be standing so close to these totems of my youth. I took several photos and because it was so early in the morning and not a soul was in sight, I edged in close to them and examined these relics. I’m glad I did. Painted on the heel of one of the frogs was the direction: BobWade.com. I reasoned that Bob Wade must have been the artist since there was no Internet when these were created; it was obvious that the address was a recent addition. I wrote it down. When we reached home I dialed BobWade.com into my computer. 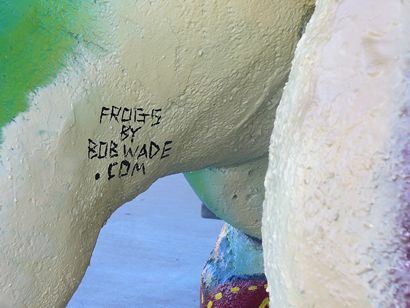 BobWade.com showed me several images of artwork and had a contact spot on the side. I clicked the window. The contact page displayed an e-address. I mailed the address asking for frog information and included my phone number. Within the hour Bob Wade had called my home and within 24 hours my wife and I were sitting in the Wade’s studio talking frogs, iguanas, giant saxophones and car-sized football helmets. Sometimes, things just come together. 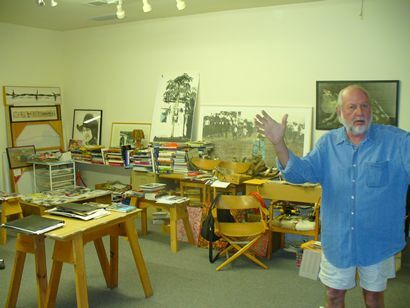 Bob Wade’s studio, a large, converted, two-car garage, looks as though a pack of teenaged boys was allowed to hole up and hide out there for a few weeks. The walls are pasted with photos of girls in bikinis, framed pictures of cowboys and cowgirls, mysterious remnants of wire and wood cover the ground and cupboards, books of all types are almost stacked on their shelves, tables hold all sorts of animalia in all positions and varying stages of dismemberment, pictures of persons that no one in the room knows the names of, easels supporting canvases of half-formed images waiting patiently for attention. In short, it is the studio of an active and enthusiastic artist. Luckily for us, there was a pathway through it all and Mr. wade led us through the bric and the brac, pointing out those items that he deemed necessary of attention. The first was the five-foot long, Altoid-tin crocodile on the far wall. Mr. Wade began the frog’s saga by explaining how the owners of Tango’s nightclub had contacted him asking for some sort of artwork for the roof of their new club in Dallas. Mrs. Wade recalled how the owner had mentioned wanting something like a “hand with a diamond ring on it or somethin’ like that.” However, the frog idea came about almost as an epiphany. Mr. Wade recalled how, as he hung up the phone from that initial conversation, he turned to look at a shelf in his studio and noticed a few ceramic frogs, collected over the years, in varying stages of dance and play. He thought that since this was Texas, putting a few “critters” atop the club would probably go over pretty well. For a guy who’s made a living painting over photographs of Texas’ past, this was a remarkably prescient idea. In the end, the frogs had to go. Not because of the lawsuit, which Wade was eager to point out that he had won, but rather because the club closed. Soon afterwards the frogs began their trek to Carl’s Corner after a grand send off party. Initially, all six frogs took the stage on top of Carl’s gas pump awning. However, three were bought and went on a traveling show across Oklahoma and Texas. Finally, these same three leapt to Houston where they now occupy the roof of a Chuy’s restaurant in The Woodlands. The other three still await their placement on the new Carl’s Corner. They have been repainted, repaired and seem quite ready to reoccupy their former position on the roof. Several of Wade’s pieces are more mobile than you would think objects of such gigantic proportions should be. 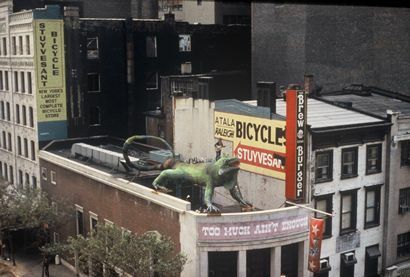 In addition to the frog’s journeys, the 40-foot long, 12-foot high iguana that once stood famously on the roof of the Lone Star Cafe in New York City now rests idly in a Fort Worth warehouse. There is a giant fish in the water outside the Hula Hut restaurant in Austin that was initially on the roof of a Dallas hamburger spot. 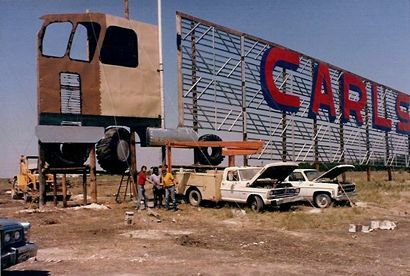 And then, not as mobile but certainly as subject to change as the rest of these works, the framed, big-rig truck that has advertised Carl’s Corner to every south bound motorist on I-35 over the years was built, of course, by Bob Wade. So, go ahead and blink. Rub your eyes, refocus and look again. Wade’s work will still be there. You can’t miss it and, more appropriately, you shouldn’t. Very special thanks to Lisa and Bob Wade for their time, patience, photographs, hospitality and, of course, those wondrous works of art.